ELC: Were you involved with Pony Express before you took ownership of it? I worked part-time here for 2 years before I took ownership of it. I owned a seasonal business, Darts and Things, just down the street. The man who owned Pony Express at the time needed surgery and was going to be gone for 6 weeks. I told him as a favor, ‘why don’t I just come up and see if I can handle it.‘ Within a week after I started, he handed me the keys and said he’d be back in 6 weeks. After that, I worked part time for him when he needed extra help. He was retired and this was his second business, and eventually we made a deal and I took over in 1996. ELC: Why did you want to be a business owner? Like so many, I thought being a business owner meant I’d automatically become well-to-do and I could call my time my own. Little did I know that my time is my customer’s – right from the get go! Our staff is small. There’s Rod and I and 1-1/2 employees. 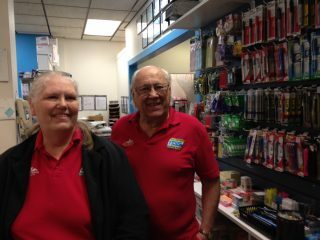 Rod and I work all the open hours and more, as many as it takes to run the business. Running a business is running a business. It doesn’t matter what your product is, you can learn the product and that’s what I did here. I fell in love with it. There is such a variety of things to do in this business. ELC: What are some of the most popular services you have here? Pony Express also offers office supplies, greeting cards, passport photos, notary services, digital fingerprinting and much more. Copies, shipping, postal services, individual customer service, private mailboxes. 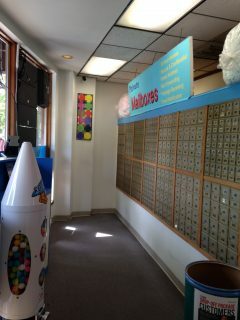 We rent a computer to use here, so you can print out return labels or print from your email. We also buy used textbooks in good shape. There’s a company back east where college students can rent or buy books for the year and then return them to us. We buy them back if the books are in good shape and we send them back to the company and the company puts it back in their inventory. We had one chemistry professor who had a whole office full of books and it took him 6 months of coming in every week but he ended up getting about $600 back for books that were 10 years old. The private mailboxes at Pony Express offer a more secure way of getting your package instead of having it thrown over the fence when you’re not home. ELC: What are the most unusual things you’ve ever shipped? For me, the coolest was the day we shipped a costume bunny head to a theater in Canada – it stood about 5 feet high, and it was pink and had bunny ears, made out of papier mache. The thing that Rod likes to brag about was last fall. There was a tailgate grill that goes on the back of a truck that you take down to the game. We sent it to a Patriot fan and he was going to use it back east. So Rod set it up so that when they lifted the lid up, they’d see a Seahawks logo. We didn’t hear from them at all so we don’t know if they were mad or if they laughed! ELC: How do the digital mailboxes work? We take a picture of the envelope and upload it into your digital mailbox number so you can go into your account and look at the outside of the envelope and see who the mail is from. You don’t even have to come down in person, you can do it online. You can also have us open your mail, scan it and send it to you. Then we save it or shred it. We have people all over the world who have digital mailboxes. ELC: How has this business changed in the 22 years you’ve been here? At one time, it was primarily just UPS shipping. UPS has their own stores now competing with us so we have really had to analyze what we do and how we do it. Where most of our profits were in the shipping, our profits are now in the mailboxes and providing services for the mailboxes. One of the key things that is different about us from UPS and Fed Ex is that we do them all – UPS, Fed Ex, DHL and the post office. 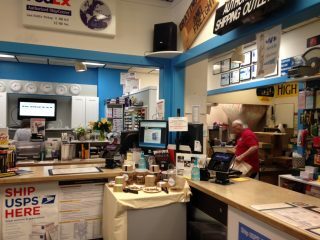 If you have a return for UPS and a return for Fed Ex, you can make just one stop here. ELC: How long have you and Rod been married? We’ve been married for 30 years now. One of the key things is that neither of us remembers why we fight, if we fight. We deal with it and get on with it. At the end of the day, when we drive home, we talk about business, but when we get home, and open that door, then our together time starts and we don’t talk business. 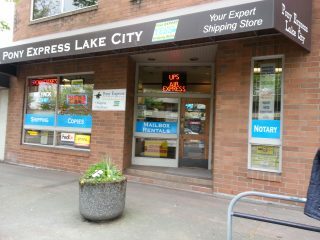 ELC: Can you name two or 3 of your favorite places in Lake City? It’s not here anymore but Claire’s used to be one of my top places for breakfast so I miss them. We like Elliot Bay Brewery a lot. New signage is coming soon just in time for the new bus stop. The company colors will change from blue to red. I have two right now – one is the bus stop being expanded out front. We’re losing our closest parking spaces. The other thing I find challenging is the transients. I know that everyone is struggling with it but my landlord has had to pay a lot to put fencing up and he has a security guy come here every morning who wakes up people sleeping in the stairwell before anybody gets to work in this building. People need to understand the difference between homeless and transients. There is a difference. For instance, the tent city that was up the street for homeless, they policed and took care of their own location. Homeless people want to get shelter and services and get out of homelessness. ELC: What opportunities do you see or things you think are going well in Lake City? I haven’t had too much involvement with Lake City Future First, but I know Rod talks with them all the time. They’re doing lots of things here. When we owned Darts and Things, we were one of the biggest professional shops on the West Coast. We had it for 10 years. I was ranked the third best female player in the state of Washington for soft tip darts and I was ninth for steel tip. I got my masters in soft tip darts and I played with a couple of other players representing the U.S. over in Britain. I think that people would be surprised to find that Rod is really the main key to our success. I attribute our success to him because he’s the one who really wants to make sure the customer leaves here satisfied and happy. Whereas me, I wear my heart on my shoulder. Rod’s a really good people person. If it weren’t for him, we probably wouldn’t be here! We both really love this business and we are very happy helping the community.